After harassing and threatening a homeless man trying to make a living, cops bragged about it on social media. Naturally, they were owned by Facebook. Kennewick, WA — A 38-year-old homeless man was attempting to earn some honest money by providing a much-desired service to the residents of Kennewick, Washington last week, when he was threatened with extortion and arrest by the local police department who effectively ended his enterprise. 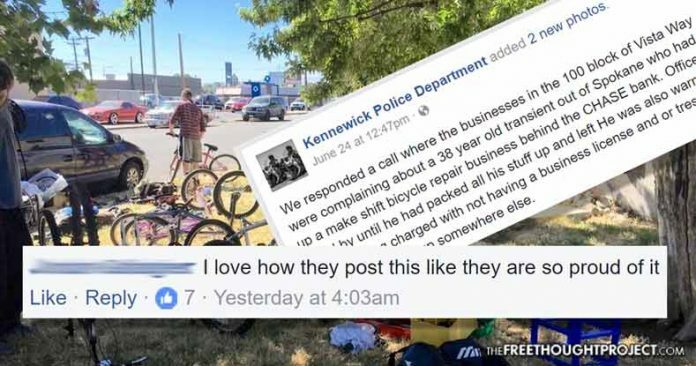 After the Kennewick Police Department threatened the homeless man and prevented him from making a living, they took to Facebook to shamelessly brag about it. However, Facebook was not buying it. The homeless man was not selling drugs, panhandling, or harassing local businesses and their patrons. He was providing willing customers, who were in need of bicycle repairs, with a service for which they agreed to pay him. The man was operating out of a van and was set up in a parking lot behind a bank, under a tree, out of the way. He was harming no one, and, in fact, was actually helping. However, he had not asked his local government for permission to make a living through the offering up of his skills — so, they set out on a mission to destroy him. We responded a call where the businesses in the 100 block of Vista Way were complaining about a 38 year old transient out of Spokane who had set up a make shift bicycle repair business behind the CHASE bank. Officers stood by until he had packed all his stuff up and left He was also warned about getting charged with not having a business license and or trespassing if we find him set up somewhere else. After bragging about ruining a man whose only ‘crime’ was trying to make a living by selling his skillset, the police department received some much-needed backlash. They’ve received hundreds of comments on their post calling them out for shutting down an honest man trying to put food on his plate as well as bragging about it. One user summed up the situation nicely, noting that threatening the man with arrest over a business license is nothing short of extortion. “Hi, we’re the police/government. We steal your right to sell your skills for your own survival and be a productive member of the community, and then sell it back to you in the form of a license. Because we’re above the law and too cheap to earn a living besides through extortion”. Which is worse: people running their own businesses, or bums sleeping in corners all over the city? Taxation, licenses, and fines are all Theft and Extortion. Another user pointed out how senseless it is to go after a man who is earning money, trying to not be homeless, while at the same time decrying their approach to homelessness. Way to go Kennewick PD, you have successfully stopped a dangerous criminal. If he wants to eat he should beg for money like all the other homeless in this communist state. It’s a shame that some of them actually try to work instead. Taking a humorous and sarcastic approach to the ridiculous nature of this post, one Facebook user pointed out the obvious. Please go to every yard sale, every kid mowing a lawn, and everyone who has a car posted for sale and ask them for a business license. I don’t want anyone doing business without paying their extortion fees to you and your gang. Don’t you have a church bake sale to go bust up some where? You proudly publish the fact that you harass entrepreneurial people and make it hard for them to work and earn an honest buck? What was the public safety concern? Might he have accidentally left someone’s tires a bit squeaky? Thank God you were there to keep the community safe! What the response to the Facebook post illustrates is that a heartening trend is growing on social media showing that people are waking up to the state persecuting individuals over victimless crimes. A previous example of this trend was illustrated by the Alameda County Sheriff’s department posting a photo of a deputy arresting a man for selling fruits and vegetables on the roadside and attempting to justify it. When people read the department’s justification, they lashed out — peacefully — to let them know what they were doing is wrong. Legality does not dictate morality. The photo, which has sparked so much backlash online, depicts a deputy confiscating strawberries and mangos while the man selling them sits on the sidewalk in handcuffs. What’s going on in the photo is clear as day. However, the sheriff’s department took to penning a lengthy post in a futile attempt to explain and justify it. Naturally, they were owned by Facebook. Hopefully these police departments heed the advice on their own pag because this is how progress is made. The citizens already see it. It’s time for cops to see it too.